Lewiston resident Justin Beliveau won a bronze medal in swimming in Abu Dhabi this month. 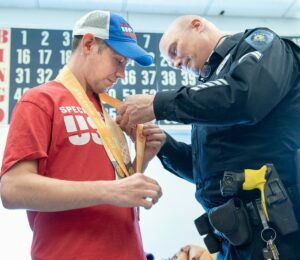 LEWISTON — Since his first athletic endeavor in track and field as an eighth-grader, Justin Beliveau has loved the Special Olympics. Over time, the 30-year-old Lewiston resident has run the mile, plunged downhill on skis and competed in other athletic events at regional, state and national Special Olympics. What he’d long wanted, though, was to get a shot to go to the World Games, the one event where athletes with special needs from across the globe gather. This month, Beliveau got his chance. He came home from a two and a half week odyssey to Abu Dhabi with warm memories and a bronze medal in the 50-meter freestyle. “I am very, very proud of myself,” Beliveau said. About 60 of Beliveau’s friends, family and neighbors gathered for a surprise celebration at Blake Street Towers on Wednesday, happy to show their support for his success and to share in his joy. 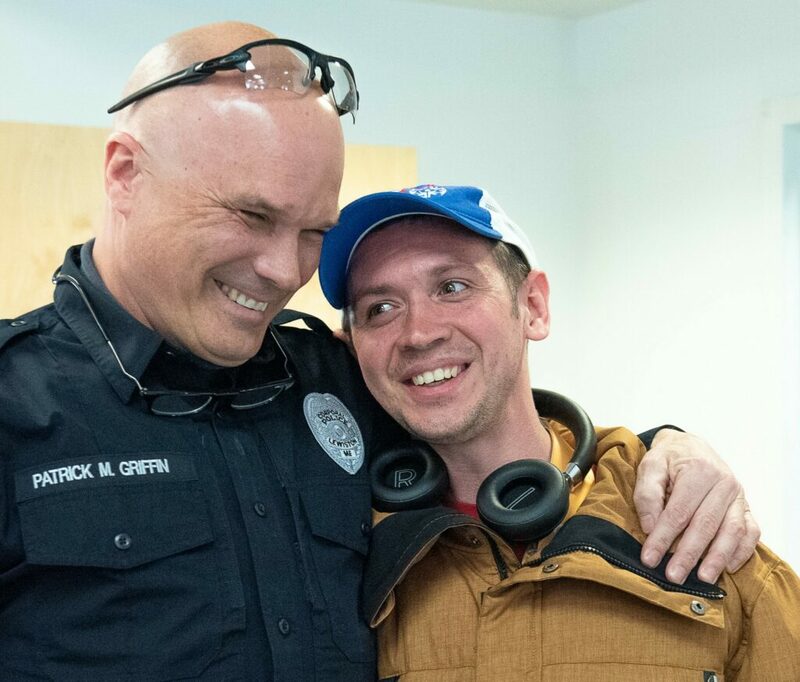 Patrick Griffin, a Lewiston police corporal who has helped with Special Olympics for a decade, said Beliveau has always relished the chance to compete. “He’s a brave guy,” the officer said. Griffin was among the 89 law enforcement officers who helped carry the torch from Greece to the games in the United Arab Emirates, a collection of seven tiny states on the Persian Gulf. 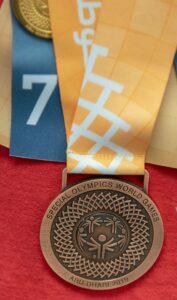 He said he spent three weeks there raising awareness about the World Games and the more than 7,000 athletes from more than 170 countries who came together for them. “It was a blast,” Griffin said. Michelle Roy, administrator for the JFM Navigators program run by the nonprofit John F. Murphy Homes in Auburn, said Lewiston police are amazingly supportive of the Special Olympics. “We’re really lucky,” she said, that so many city officers are willing to do so much for the athletes. She said Beliveau got the chance to go the World Games after he applied for one of the two spots for Mainers on the USA team. They were looking for a male swimmer, Roy said, so Beliveau made the case that he should get picked along with Madison Mooers of Hampden. Once selected, Beliveau spent a considerable amount of time in the pools at the YMCA and Bates College, both in Lewiston, trying to master the flip turn he would have to make halfway through the 50-meter swim and to polish his skills in the water, friends said. Beliveau said he arrived at a hotel in Abu Dhabi at 3 a.m. after a “very, very long” 12-hour flight that delivered him in plenty of time to make the March 14 opening ceremonies. Walking into a big arena with more than 300 American athletes “was really, really amazing,” he said. He said he felt overwhelmed at the size of the crowd and the realization that he represented the United States on the world stage. He said that looking around confirmed his belief that “you can do pretty much anything” is actually true — because he was there in front of that giant crowd, with all those people and ESPN’s cameras broadcasting all of it. He competed in a few preliminary events in swimming — backstroke, a relay team and freestyle. His time proved good enough to earn him a spot in the freestyle finals. When it came time to race, he said, he just did it as best he could. After he clambered out of the pool, Beliveau asked his coach what time he got and how he’d done. That’s when he learned his 46.31-second time was good enough for a third-place bronze medal. “I almost cried,” Beliveau said. Diane Beliveau said her son phoned her after taking the stage to collect his thick bronze medal. “That’s really awesome,” she told him. He sent her a picture of himself with the medal, beaming. During the closing ceremony, Beliveau said he swapped his hat for the elaborate headgear of an Arab competitor, part of the traditional trading that goes on at the end of the games. That white keffiyeh is now a favored keepsake from the journey. Though he was homesick by the end of the trip, Beliveau said he hopes to get another shot someday. In the meantime, he said, he’ll continue to compete in whatever Special Olympics he can.